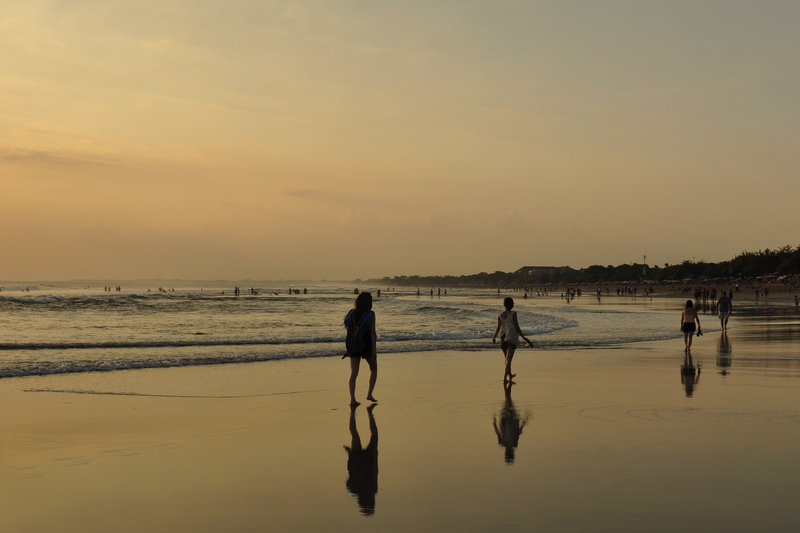 The evening ritual of sundowners is an absolute DO NOT MISS if you ever visit the Indonesian island of Bali. Kuta Beach is walled off from the road and amongst the trees that line the top of the beach can be found the beach bars. Now, if your idea of a bar includes a roof and walls, then you may be surprised by what constitutes a bar along this stretch of coastline, where no more than an ice-and-drink-filled esky (cold box), an umbrella and a plastic chair are required. With Kuta on the western side of the island, the sun sets directly off the beach and I have to say that the sunsets are fantastic. Given that the drinks are also always cold, there really is no better start to your evening than heading to the beach, watching the sun set over the Indian Ocean as you listen to the waves crashing on the shore, discussing your day and making plans for dinner. I will admit that the “hawkers” on the beach can be persistent, but my experience was that if you are polite, jovial and firm they do eventually take the hint. Even better still, take the time to talk to some of the ladies and you may find that they have fascinating stories to tell and love a good laugh. Just remember that they are trying to do nothing more than make a living so, please, treat them with respect. Depending on where you have chosen to stay, there are any number of options for an evening drink but I would recommend Joseph’s Bar if you’re up by the start of the pedestrian walkway in front of the Legian Beach Hotel. He’ll definitely look after you and ensure that your Bintang is always full and cold. 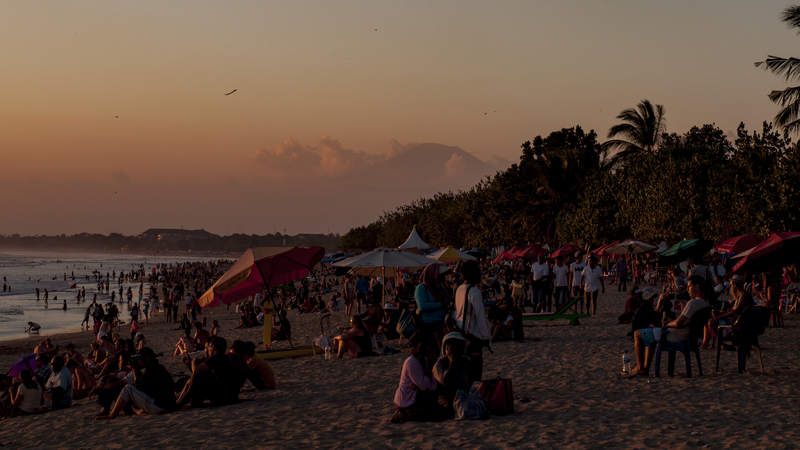 A volcano peeps out from the clouds as the crowds gather to watch sunset from Kuta Beach. Each bar owner has their own unique way of keeping track of your tab. Some work on the crate principle. When you arrive you will be provided with a chair and an empty crate. Every time you finish a drink you put the empty in your crate and when its time to leave the bottles are counted and charged accordingly. Joseph is well geared to big groups with a crate/bottle top combo. On arrival you will receive your empty crate and when each opened bottle is delivered you are also presented with the bottle top. When leaving you will be charged based on the bottle tops until the last person leaves and they will have to pay for the balance of what is in the crate. Both methods worked extremely well and in all our visits we never had an issue with the bill. Whatever you do in Bali make sure you have sundowners on at least one evening and if you do it on your first night I can almost guarantee you won’t miss a night during your stay.